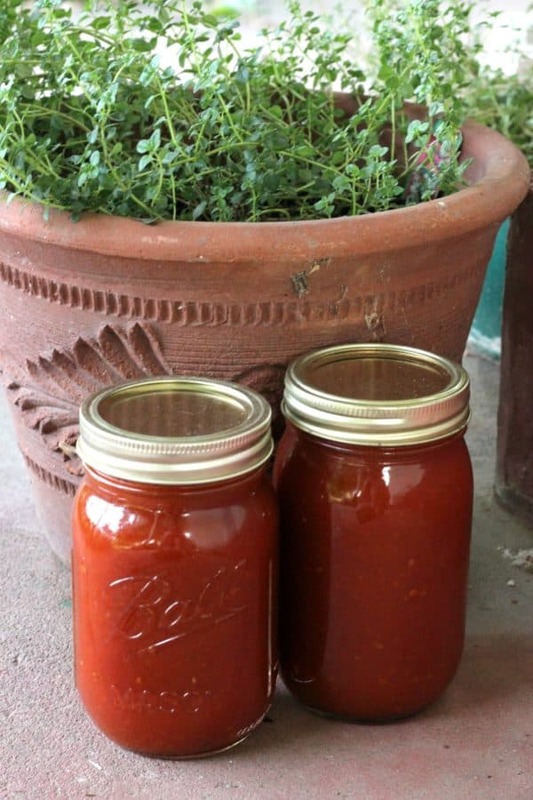 July 17, 2018 2 comments on "Easy Apricot Barbecue Sauce Canning Recipe"
I am always on the lookout for good barbecue sauce recipes. I recently purchased a big box of apricots and started looking for recipes to use up all my apricots. 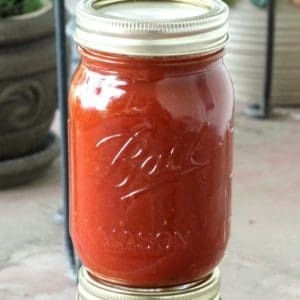 Seeing that apricot barbecue sauce recipes are popular on Pinterest right now, I decided to come up with a version of one of those recipes that was safe for canning. I took the barbecue sauce recipe from the Ball Complete Book of Home Preserving cookbook and slightly modified it so that it would be still safe for canning. It is never a good idea to change canning recipes if you don’t know if it is safe or not. When making changes to a canning recipe, the main thing to take under consideration is whether or not you are changing the acidity level of the recipe, which might make it unsafe for canning. For this recipe, it is totally fine to swap out some of the apricots for some of the tomatoes and to slightly change the spices without changing the acidity level of the recipe, and that is what I did. The result was a wonderfully tangy apricot barbecue sauce that goes great with chicken or pork. My family loved this recipe, and I will definitely be making it again! In a large stock pot, combine chopped tomatoes, apricots, onions, garlic, and hot pepper flakes. The hot pepper flakes are completely optional. It’s totally fine to leave them out if you want. Bring the mixture to a boil, stirring constantly. Reduce heat, cover, and boil until the tomatoes and apricots soften, about 30 minutes. Next it’s time to blend up the mixture into a smooth sauce. There are a couple of different ways you can do this. One way is to pour small batches into your food processor and then process until smooth, repeating until the entire mixture is completely smooth. I always use my immersion blender to do this. It is very inexpensive, and an invaluable tool in the kitchen. I use it all the time. An immersion blender is a stick blender that you can put right in the stock pot and blend it all up at once. You will have a smooth sauce in just a few seconds. Return the sauce to a boil and simmer until the mixture has been reduced or cooked down by 1/4. Stir in the brown sugar, vinegar, lemon juice, salt, dry mustard, and paprika. Return the mixture to a boil over medium heat, stirring occasionally. Reduce heat again and simmer until barbecue sauce is thickened to the desired consistency, which will take about 30 minutes. Fill your boiling water canner about half full with water, and then bring the water to a boil. Next, sterilize your canning jars, lids, and rings in the dishwasher on a quick rinse cycle. Ladle the barbecue sauce into the canning jars, leaving 1/2 inch head space. You can easily measure the head space with this inexpensive canning funnel. Wipe the rims of the jars with a damp towel or paper towel, then place the sterilized lids and rings on the jars. Place the jars in the boiling water canner, making sure there is at least 1 inch of water above the jars. Add additional water if necessary, then bring water to a boil and process the jars for 20 minutes. Remove the jars from the canner and place the jars on the kitchen counter to cool. Sealed jars can be stored in the pantry for 1-2 years. If you have any jars that didn’t seal, just place them in the refrigerator and use them in the next week or two. 2 Comments on "Easy Apricot Barbecue Sauce Canning Recipe"
I used to be on a BBQ team(yes there is such a thing) We would compete at Memphis in May every year. That’s the world’s largest BBQ competition. We had a barbecue sauce that was very similar to this, but instead of apricots we used plums it actually won us a couple of awards.